“This is not a sustainable position and the industry should no longer acquiesce,” he added, after accusing governments and the European Commission of being “in cahoots with protest movements”. On Saturday (12 December), world governments approved a historic agreement to cap global warming at “well below” two degrees above pre-industrial levels, and aim for 1.5 degrees in the future. Coal is a fossil fuel that contributes to carbon emissions and global warming. Euracoal styles itself as “the voice of coal” and says it works closely with the EU institutions on policy. The Paris agreement was greeted with scenes of celebration and emotion among delegations, who struggled for 13 days to overcome divisions between developing and developed countries. “’Keep it in the ground’ campaigns will morph into campaigns to ‘Put it back in the ground’, watched with growing incredulity,” he predicted. It was an achievement to get the agreement between 196 nations but, Ricketts said, it was the first step to a “global government”. Euracoal has 34 members from 20 countries, including France, Germany, Italy, Spain, Poland and Great Britain, include national coal associations, importers associations, research institutes and individual companies. Ricketts turned his fire on NGOs, many of which demonstrated in Paris during the talks, and the European Commission, which he claimed was “outmanoeuvred” by the US at the COP21. 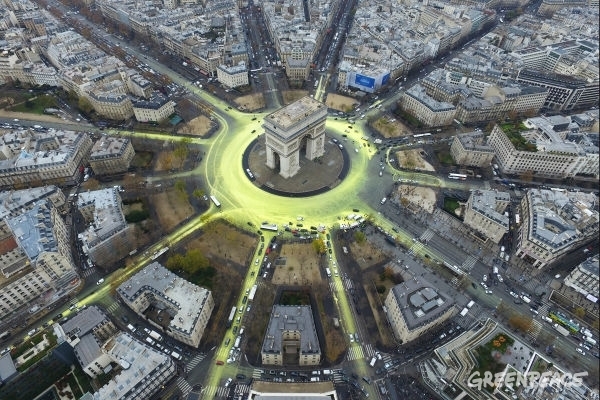 “The rule of law is being replaced by mob rule,” he said, after describing a Greenpeace climate protest that painted roads around the Arc de Triomphe yellow to represent the sun during the COP21. “The ballot box is seen as an inadequate tool by those who know better than the ‘man in the street’ about complicated problems such as climate change,” wrote the Euracoal boss, after alleging that governments used NGOs, some of which they fund, to bypass the democratic purpose. Ricketts scoffed at the idea that the European Commission had helped lead the world to the climate agreement, as it has claimed. Ricketts said that no other countries agreed to any targets. In October 2014, EU leaders agreed to reduce greenhouse gas emissions by at least 40% compared to 1990 by 2030. They also agreed to boost renewables and energy efficiency by 27%. “No other countries agreed to any targets. As a minimum, the EU must, before 22 April 2016, submit a less ambitious climate plan to the UN,” Ricketts said. In the build-up to Paris, countries submitted Intended Nationally Determined Contributions (INDCs) to the UN. These climate reduction pledges will be reviewed every five years under the COP21 deal. Euracoal has lobbied for an EU greenhouse gas reduction of 30% by 2030. “We clearly don’t ‘lead the world’ and must now get back to the dull-old business of wealth creation,” Ricketts added. Other businesses and industries have been broadly supportive of the deal in Paris. Earlier today, German business giants called on the EU to increase its 2030 targets. Ricketts took the top job at Euracoal in August 2010. He previously worked for the International Energy Agency, as a coal analyst. It is not the first time that Ricketts has attacked green NGOs. He recently accused the European Climate Foundation of “twisting the truth” and “undermining democracy with “money and power”. In an opinion piece for EURACTIV, he asserted that coal had lifted humanity out of servitude. Euracoal has also released a calendar of cartoons highlighting the unreliability of renewable power. Jiri Jerabek, Greenpeace EU energy policy adviser, said: “Coal needs to stay underground to avoid climate change, but this is nothing new, not even for the coal industry. In November the UK announced a plan to phase out all its coal-fired power stations by 2025, and Austria, Portugal and Finland will also become coal-free within the next decade. The Climate Change Agreement will do nothing in reality as there is a far greater force in the world destroying it, other than saving it. A force that can never be beat other than by the eventual death of our planet. Until the sheer greed of the few and the insane thinking of our political elite changes to sustainability, planet Earth is literally destined to its own destruction, no matter how many climate conference the world has. Strange although this is fact and not fiction, things just get far worse by the decade. Are we really an intelligent species, it has to be asked. Apparently not based on all known parameters of common-sense and intelligent reasoning! Warning, coal industry throwing toys around – having temper tantrum cos it did not get its own way. I did like this “The rule of law is being replaced by mob rule,” – as opposed to “the rule of the brown envelope”? of which the power/coal industry is a past master. Ah well all things must pass & it is time to say ta ta to coal. Mr Ricketts – waving or drowning? The latter I suspect – still there is always Poland.